Five Britons have been kidnapped from Iraq's finance ministry in Baghdad, the British government has confirmed. Those abducted include four bodyguards from security company Gardaworld and a finance expert. Witnesses and sources told the BBC that the kidnappers wore police uniforms and arrived in up to 40 police vehicles. 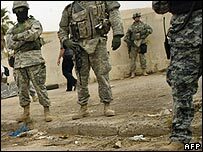 The UK foreign office says it is in contact with Iraqi officials on the issue and PM Tony Blair said "We will do everything we possibly can to help". The British government convened an emergency meeting of its Cobra crisis management committee on Tuesday afternoon. Also on Tuesday, Baghdad was shaken by a bus explosion which killed at least 23 people and injured about 55, and a car bomb which killed at least 17 people, hurt at least 36 and destroyed a Shia mosque. The US military also announced that 10 of its soldiers were killed in Iraq on Monday, including two in a helicopter crash. At least 112 US troops have been killed so far in May, making it the deadliest month this year. There are conflicting reports about exactly how Tuesday's abduction took place. Witnesses said it was carried out by what appeared to be a police unit. The street was sealed off at both ends and the kidnappers, in police camouflage uniforms, walked straight past guards at the finance ministry building on Palestine Street, the witnesses said. A police source told the BBC that dozens of police vehicles were used in the operation. 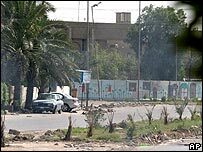 The BBC's Paul Wood in Baghdad says that if such reports are true, it could point to the involvement of a renegade police unit, possibly special commandos. While it has been possible in the past for criminals or militants to hire police uniforms and vehicles, he says, the scale of this operation suggests real police involvement. It is well known that the Iraqi police are heavily infiltrated by militia groups, leading to split loyalties and corruption, our correspondent says. Gardaworld security agency - a Canadian-owned firm largely staffed by British former service personnel - has confirmed that four its staff were among those taken. Gardaworld is one of the biggest suppliers of private security in Iraq, and is thought to have hundreds of staff in the country. It was not clear what job Gardaworld's client was doing in Baghdad. American management consultancy Bearingpoint said it had been told that one of its employees was among those captured. The BBC's security correspondent, Frank Gardner, says a British crisis team, including police hostage negotiators, members of the secret intelligence service, and regional experts, is being assembled to establish lines of communication with the kidnappers. About 200 foreigners of many different nationalities have been kidnapped in Iraq over the past four years, though the number has fallen dramatically since a few years ago. This is thought to be the first time Westerners have been abducted from a government facility. Correspondents say hopes for the captives' future depends on who is holding them. The Sunni al-Qaeda has a record of killing captives, while if it is a Shia group, there may be scope for political negotiation, our correspondent in Baghdad says. If it is a criminal group, then Gardaworld can expect a ransom demand, he says. The British government itself has a declared position of not paying ransoms.